Happy Tuesday everyone! I would LOVE to be able to say it's a beautiful, sunny, day in West Virginia, but I can't. Its cold, wet, and windy. COME ONE Mother Nature! We are over this! Any who, I digress. Something that I haven't talked a lot about on my blog is that Studhubs and I are on a journey to being debt-free. One of the things we've done to achieve this goal is to go cash only. If you guys are interested in how do this, let me know in the comments below, but one of the benefits of a cash-only lifestyle is that you are VERY aware of how much you are spending on a week-to-week basis. The area that really seems to hit us hard is groceries. We have a set budget, and when I am meal planning I will do what my friend April calls "Fridge-Foraging". That's where you go through your fridge and pantry to concoct a delicious meal, at minimal cost, with items you have on hand, and that is how this amazing Crockpot Hoisin Chicken Recipe was born. To begin you will place the chicken into your crockpot. I had frozen chicken tenderloins on had, but you could use chicken breasts, chicken thighs, whatever you have will work. After that you will combine the soy sauce, hoisin sauce, garlic, dried minced onion, ground ginger, brown sugar, and sriracha into a bowl. Also, because I am ballin' on a budget, I added a chicken bouillon cube as well as a 1/3c water in place of the chicken broth. It's works great and will save you some money in the end. Pour it over the chicken. Cover, turn the crockpot to LOW, and cook for 4 HOURS. After 4 hours remove the chicken from the crockpot and shred it. For the next step, you will pour the broth from the crockpot into a sauce pan, using a sieve to strain any unsavory bits. Now you will combine the cornstarch and 1/3c water and mix it together to make what is called a "slurry". Pour the slurry into the broth. Turn on the heat and bring to a simmer. Whisk until the sauce thickens and becomes glossy. Return the chicken to the sauce and stir everything together until everything is coated. 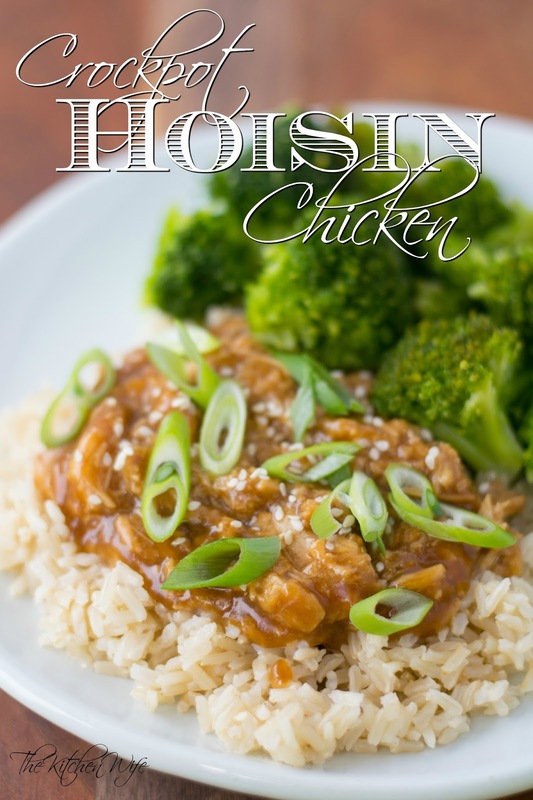 I served this Crockpot Hoisin Chicken over a bed of brown rice with a side of steamed broccoli, and I topped it with some sliced green onions and sesame seeds. 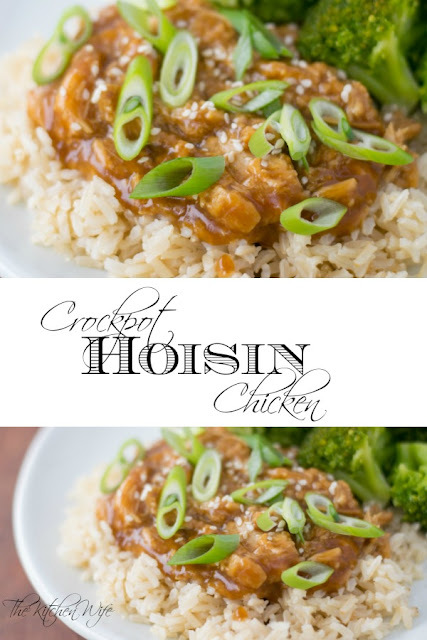 It was SOOOO yummy, but I will confess it was a little salty, so I think I would place a potato in the crockpot in the future to help absorb some of that, but it was delicious and we will defiantly try this again! I also think this would make a GREAT pot roast, so that is next on my list! So yeah, whether you are trying to save a buck, budget your money a little more wisely, or are at the end of the month & trying to make it work, magical things can come from a fridge-forage so get in the kitchen and give this Crockpot Hoisin Chicken Recipe a try tonight! 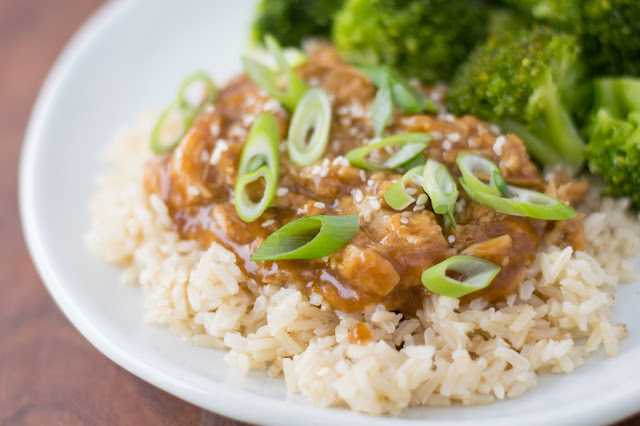 Combine the soy sauce, hoisin sauce, chicken broth, brown sugar, sriracha, dried minced onion, minced garlic, and ground ginger into a mixing bowl and whisk until smooth. Pour the sauce over the chicken, cover, and cook on LOW for 4 hours. After 4 hours remove the chicken from the crockpot and shred. Strain the broth into a sauce pan. Combine the cornstarch and water into a bowl and mix together to create a slurry. Pour the slurry into the broth, bring it to simmer while whisking until the sauce thickens and become glossy. Add the chicken to the sauce and mix together.